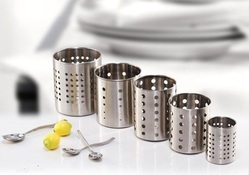 We are providing a large assortment of Cutlery Holder and Strainer in various sizes. We deal in Cutlery Cylinder. With very rich experience and conformity, our experts manufacture this array of Kitchen Holder. They are smooth in finish and available in many speculations. They are quality assured and smooth in finish. Too they are uniquely designed and available in many specifications. Too they cost of this array is also very nominal. Owing to our in-depth knowledge in this domain, we are specialized in providing Dining Table Spoon Stand. In order to meet the precise needs of our customers, we offer the Tissue Cutlery Stand in different sizes and designs.